Just a quick post here to let all know that I'm alive and well and even running a bit! It has been difficult however to find time lately to post anything due to the fact that we've been between Louth and Galway helping out as much as we can with a tragic situation for my wife's family and the passing of a little angel. I'm back in Galway this week again and hopefully I'll get out for a longish run some evening... last week I managed a 4, 4, and 5 mile combination - which is just not good enough preparation for an imminent half marathon. 5 Miles on the Prom. A Decent Five Miler Around Gleann Mór. Out the house and down to the pier... then up again and around Gleann Mór. Gleann Mór is Gaelic for 'the Big Glen' and a big glen it is - at least in one spot! This was a nice run on a lovely evening - the only mistake I made was to leave it a little late before going out, as it became quite dark for the last twenty minutes (and I didn't have my flash light friends to guide me around!). I reckon I ran it all at around an 8.10min pace - which was not too bad for me! The run definitely kicked off a few cobwebs. On the sporting world front: our soccer boys beat Estonia by four goals last night, thus ensuring their safe qualification for next summer's Euro tournament (although there is another leg to go, but surely 4-0 is a safe advantage to bring home...). Crack open the polish beer...! The rarest of combinations: Big Ron, Con Job and I, at night in Seanadh Phéistín. This was my first excursion into the great mystery that is night running. I can't say I enjoyed the experience wholeheartedly... truth is, I felt it a bit disorientating. The little head lights provide good light, but only for the very immediate road ahead - which leaves you with the feeling of running in tunnel. Hills seem to go on for miles at night and there is a general sense of disorientation. Having stated all the negatives, I should mention the positives - and they are there in spades. For starters, it beats the heck out of running on a treadmill. Secondly, it's always good to run in good company and Big Ron and Con Job provided that in spades and lastly, the night air was fantastic. I'm also pretty sure that I'll get used of this (and will have to if Ron and Con are to be taken at their word regarding another run next week). In all, we ran 5 miles, varying from 7.30min - 8min miles. Ron and Con ran the last mile under 6mins. Needless to say, I was left behind! 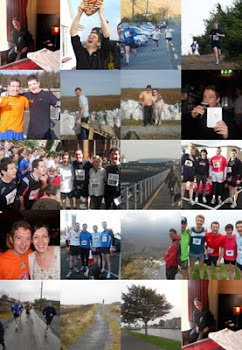 The Waterford Half Marathon grows ever nearer - only 6 weeks to go now and I'm at least recovering from my recent wobble! On Friday I trotted a decent four miler along the Salthill prom and out as far as Knocknacarra Cross. No problems there! The weekend brought me to County Louth where D and I supported the wonderful Stabannon Ladies Football team as they won a very hard fought Leinster title. Inspired by their great achievement and that of Máirín who was completing her very first marathon in Dublin on that day (fond memories of last year), I went out for a 7 mile run on Sunday and was accompanied by Benny for the most part. It's always better to run with company, and especially good to run in Benny's company. So now: I hope to get a few good runs in this week, starting tomorrow, and culminating at some stage with a 13 miler. Yes I can?